General Motors just announced a great new program on the 2013 Malibu that is certain to steal the show this spring!Based on your information, and loyalty to the brand, you are now eligible to take part in this special. 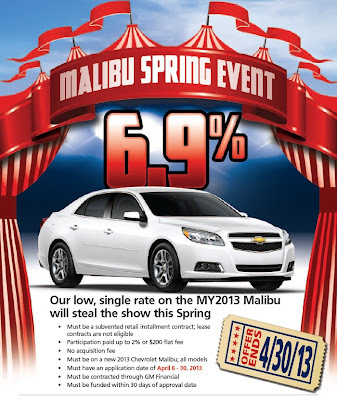 Incentives have capped the interest rate on new car loans for the 2013 Malibu at 6.9%*.This is being offered to applicants with credit scores as low as 420.There’s still time for you to take advantage of this incredible offer and for a limited-time, we are even waving the acquisition fee! 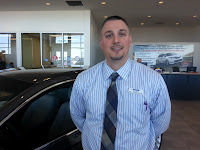 Hurry, as the deal ends on April 30th!You could be driving the popular new 2013 Chevy Malibu sedan at an even lower monthly cost than you are currently paying.And, Heiser has an impressive inventory of 2013 models, ready to deliver.It’s an outstanding opportunity to drive a new 2013 vehicle, a lot sooner than you ever expected. Saturday, April 6th, 2013marked the 5th anniversary of Milwaukee’s Walk Now for Autism Speaks. Thousands of families came to the BMO Harris Bradley Center, the new indoor home of Milwaukee’s Walk Now for Autism Speaks and the home of NBA’s Milwaukee Bucks! Families, friends and corporate teams walked for autism awareness, to raise funds for autism research, and to unite the Wisconsin autism community. Heiser Automotive Group's Team "Anything is Possible" raised over $4,000 for the cause. In total with over 3,500 walkers, $200,000 was raised by the Milwaukee Walk Now for Autism Speaks community. Heiser Automotive Group looks forward to joining the Milwaukee Autism community for the 2014 walk. Thank you Milwaukee for helping us prove "Anything is Possible!"